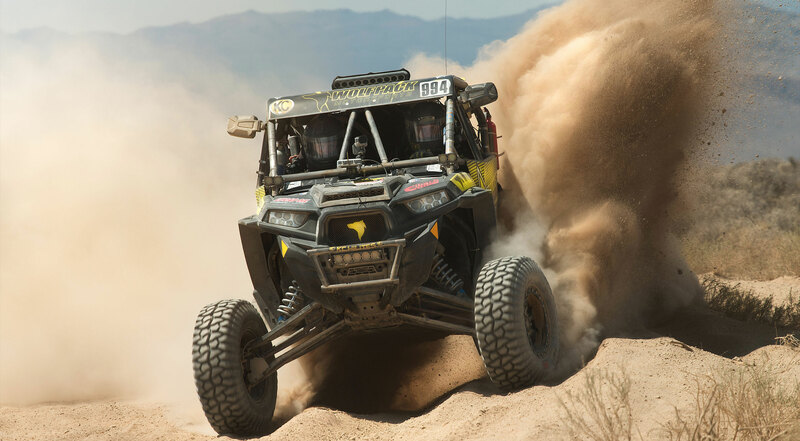 THE MERRELL BROTHERS GOT THEIR START IN OFFROAD RACING OVER 15 YEARS AGO, & HAVE BROUGHT THEIR YEARS OF KNOWLEDGE OVER TO THE UTV RACING CIRCUIT IN 2011, CREATING WOLFPACK RACING. THEY QUICKLY REALIZED THAT THE UTV AFTERMARKET WAS SEVERELY LACKING IN PARTS THAT WOULD HOLD UP TO THE RIGORS OF OFFROAD RACING, SO OUT OF NECESSITY, WOLFPACK UTV PARTS WAS BORN. THEY HAVE UTILIZED THEIR YEARS OF PRO 4 RACING & DESIGN TO CREATE THE INDUSTRY’S MOST INNOVATIVE SUSPENSION & CAGES, RANGING FROM DIRECT STOCK REPLACEMENTS TO LIGHTWEIGHT, RACE READY LONG TRAVEL KITS & OTHER PURPOSE BUILT PERFORMANCE APPLICATIONS. WOLFPACK’S PRIMARY FOCUS IS CREATING A BALANCE BETWEEN THE HIGHEST STRENGTH TO WEIGHT RATIO & PARTS THAT ARE BUILT RACE SPEC FOR EVERY TYPE OF DRIVING STYLE OR TERRAIN. DO YOU ENJOY RACING, ROCKS, JUMPING, DUNES OR JUST CRUSING TRAILS? WOLFPACK PARTS WILL MAKE YOU CONFIDENT IN YOUR UTV. WOLFPACK PARTS ARE PROUDLY MANUFACTURED IN THE U.S.A. IF YOU DEMAND THE BEST FOR YOUR UTV, DEMAND WOLFPACK!